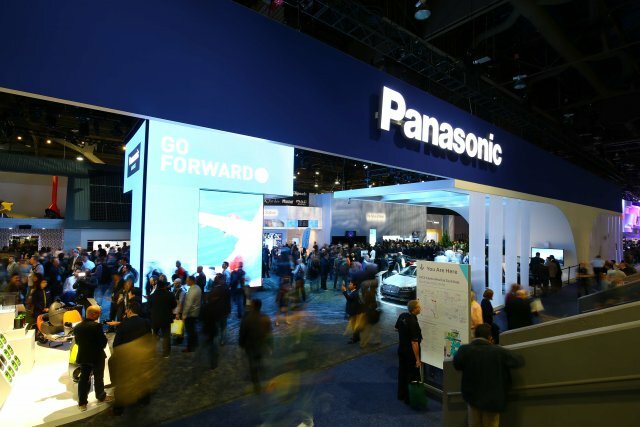 Panasonic Corporation is illustrating its concept of Smart Town at CES 2016, from January 6 to 9, 2016 in Las Vegas, Nevada, with its latest products, solutions and technology that help realize "A Better Life, A Better World" for each customer. The Smart Town in the Panasonic booth (#9808) consists of four areas of Smart Home, Business/Retail, Mobility and Stadium. Using Panasonic's Light ID solution, visitors can get information on the exhibits by simply downloading an app onto their iOS smartphones. The information is being shown on their smartphone screens in the language according to their phone settings. Under the theme of Better Living Tomorrow, the Kitchen and Living Room here showcase "lifestyles we all desire" in the near future around 2018-2020, with consumer electronics well blended into home decor. Visitors can also find Panasonic's latest products in the DEN (entertainment space), Bathroom, Home Office and Creative Garage. In addition, other related products is shown in the Green Energy and 4K corners set next to the Smart Home section. With Panasonic's advanced kitchen appliances and cloud services, this Kitchen realizes rich and healthy eating habits at home - like having your own professional chef and nutritionist in your home. In addition to Panasonic's free-style induction hob and cordless kitchen appliances such as an automatic stirrer, the company is exhibiting a built-in Smart food pantry for fermenting and maturing food. Centering around the Personal Kitchen Screen, this corner shows how connected home appliances can make cooking enjoyable with cloud-based services, such as recipe recommendations that suit a family's eating habits and other helpful suggestions. This Living Room, appointed with your favorite decor, provides an atmosphere where you can relax as you please either by yourself or with your friends or family. Built into the carpet, these speakers are integrated into the living space. You can control over the reach of sound; the sound can be directed to people who want to listen to it or away from those who may be reading or enjoying a conversation in the same room. This section introduces Panasonic's extensive range of kitchen appliances, including the MX-ZX1800 high power blender and SD-YR2500 bread maker, both launched in autumn 2015 in the U.S. Using these products, Panasonic is showing visitors how simple and easy it is to prepare healthy and delicious meals at home. Visitors can try out Panasonic's new micro-foaming facial cleansing device (EH-XC10-N), debuted last autumn in North America, that is designed for luxurious facial cleansing at home. Other personal-care devices on display include the Nanoe hair dryers, facial steamers using ionic steam, and five-blade shavers that closely contour to the skin for optimal shave. Visitors can find here Panasonic's easy-to-install-and-use home monitoring system that works in synch with a smartphone. The RULO robot vacuum cleaner introduced last year in Japan is on display for reference. 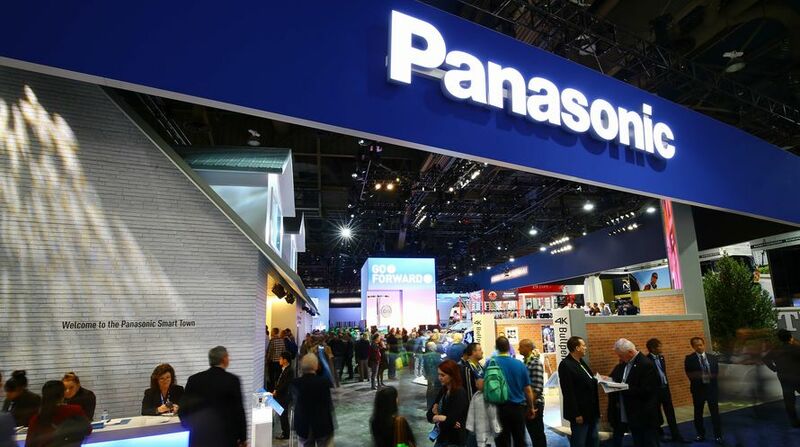 Panasonic is also introducing the concept of "Ôra," smart home and smart building solutions the company plans to launch in North America, along with its efforts to create and deliver Smart Home experience together with its partners. This area includes an in-house garage that doubles as a hobby room. Here Panasonic is introducing the world of "4K imaging" - doing everything from capturing and editing to uploading 4K images at home, using Panasonic's lineup of 4K products. In the outside garage, Tesla Motors' Model S is parked. Panasonic's partnership with the automaker is being introduced, including the 18650-size lithium-ion batteries that power the Tesla Model S. The garage roof is covered with Panasonic's solar panels. Panasonic's premium 4K products can be found here, including the world's first* 65-inch LCD television set supporting the Ultra UH Premium** specs (TX-65DX900), due to be released in 2016 in Europe, and the TX-65CZ950 65-inch OLED TV, launched in autumn 2015 in Europe. Also on display is a Blu-ray player supporting Ultra HD Blu-ray, which will be released in 2016 in the U.S.
* As of January 6, 2016, according to Panasonic data. ** The highest quality 4K Ultra HD specs set by the UHD Alliance. Panasonic is proposing its concept for a society utilizing advanced technology and solutions, through the settings of Station and Premium Department Store, as well as the technologies behind them. In addition, Technics audio products are being shown in a flagship store in this town. 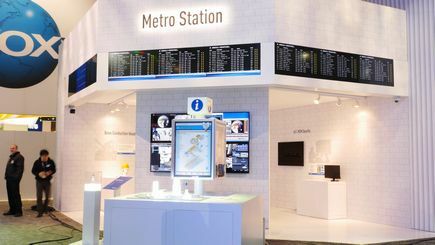 For a busy station, Panasonic's informational digital signage and multi-language-support Light ID solutions help people who use the station. Other solutions ensuring safety and security shown in the station back yard setting include a network camera that can monitor 360-degree views and provide images with resolution higher than 4K, bone-conduction headphones and a noise-cancelling microphone. Visitors can experience this multi-language-support technology by using their own smartphone running iOS. Smartphones read ID signals sent by LED lighting that flickers on and off. Panasonic is presenting solutions to protect Internet of Things (IoT) devices with limited CPU resources from hacking, using its own cybersecurity measures. In a high-end department store setting, this section is showing how store windows using its transparent screens, high-speed projection mapping system and digital signage can help create a sophisticated and completely new look for stores. Panasonic has unveiled, for the first time in the world, its projector technology for high-speed and synchronized mapping on target objects that are not marked, such as people, as a new form of projection mapping. This interactive mirror can be used, for example, at cosmetic shops for offering skin consultations and make up advice to customers. Visitors can find two solutions for 8K displays, which evolved from 4K to deliver even higher definition images. One solution is a tabletop style 55-inch 8K display that features a touch panel for better interactive control. The other, shown on a hanging style 8K display, is a cable technology that enables the transmission of a large volume of 8K content over a single cable. This is Panasonic' latest data archiver designed for data centers. It features the latest technology for long-term storing of a large volume of data using optical discs. In the setting of a roadside flagship store, the Technics Grand Class SL-1200GAE has been unveiled. This turntable commemorates the 50th anniversary of the Technics brand. It is expected to be launched this summer in limited quantity of 1,200 units, with each coming with a serial number plate. Visitors can also find new products from Technics Grand Class G30 Series, including the SU-G30 Network Audio Amplifier and ST-G30 Music Server, as well as all-in-one OTTAVA(TM) Premium Audio System and the EAH-T700 stereo headphones, all currently available in the U.S. Visitors can sample the sound of Technics technology in Panasonic's listening suite at the Venetian Hotel (29th floor, 111/115). This turntable incorporates a newly-developed direct-drive motor and high-precision motor control technology that reduce vibrations of the motor and rotational speed fluctuations. The platter consists of three layers of brass, aluminum die-cast and deadening rubber, which have improved rigidity and realized highly stable rotation. Further, the tonearm uses Technics' traditional gimbal suspension in which lateral and vertical axes of rotation cross at one point. Panasonic has combined traditional and state-of-the-art technologies in pursuit of high-quality sound. The SL-1200G, a standard model, is expected to be launched in the winter 2016. A wide variety of Panasonic's mobility solutions is being presented in the setting of a modern airport and premium car dealer shop. Here displays and presentations using globe projection are introducing a full range of Panasonic's technology and services for airlines, including the latest business class concept seat featuring a 4K display, in-flight Internet connection service and weather sensors. In addition to a prototype of its e-cockpit with the latest infotainment technology (gesture camera, curved display, line-of-sight detection, smart mirror, head up display, etc. ), Panasonic is also showing a real car installed with its ELS premium audio system, Sync3 infotainment system and batteries. 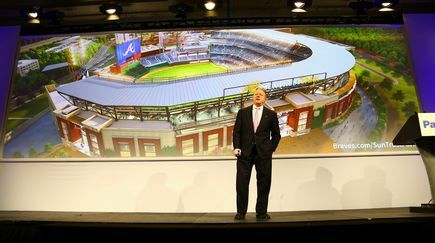 Against a stadium backdrop, Panasonic is introducing its AV solutions for the entertainment industry, such as large LED displays and image distribution systems, along with digital imaging products. This technology is being demonstrated by filming a performance of a Spartan Race (an obstacle race held first in the U.S.) with Panasonic's professional 4K studio camera, VariCam and pan-tilt-zoom camera, and screening the video on a large LED display set up in the booth. This area focuses on the new and existing models of LUMIX digital cameras and interchangeable lenses. Demonstrations are showing innovative ideas of photography unique to Panasonic, such as 4K PHOTO that captures 30 frames per second continuously in 4K and Post Focus that lets the user select the focus area after shooting. The flagship model of the ZS series compact zoom cameras boasts a 1.0-type MOS image sensor and 10x optical zoom in a high grade stylish body. This camera also supports 4K PHOTO, Post Focus and 4K video recording. The camera features a 18 megapixel high-sensitivity MOS sensor and 30x optical zoom. This compact digital camera also offers 4K PHOTO, Post Focus and 4K video recording. Light and compact, yet this premium super telephoto zoom lens has met LEICA's stringent optical standard, providing a powerful zoom range of 200-800 mm in 35 mm format. With high-speed auto focus (AF), and Dual I.S. image stabilizer that synchronizes body I.S. and lens I.S., plus splash- and dust-proof design and zoom locking, this lens also excels in operability. A lineup of Panasonic' video cameras, including the latest offerings, can be found here. In the booth, the Dolly Zoom - the subject stays in the same size while the background zoom in - is being demonstrated. With these new video cameras, users can take out a part of the recorded 4K video and convert it to Full HD resolution. They also offer easy-to-use, built-in edition tools, including tracking a selected subject. The WXF991 also has a function that lets the user create effects found in theater films, such as slow zoom, and slow and quick motion in which frame rate is changed while shooting. A symbol tower with large LED displays stands in the center of the square, and presents videos focused on the four areas and overall views of the booth, as well as Panasonic's solutions that support the Rio 2016 Olympic and Paralympic Games. Gogoro's Smartscooter(TM) is being featured here. The company aims to bring about an urban energy revolution with its electric scooters powered by Panasonic's 18650-sized lithium-ion batteries, along with Gogoro's battery swapping infrastructure. Click to go to photo album.